I’m happy and thrilled to launch a new website for NHTOA. 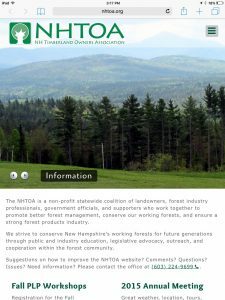 New Hampshire Timberland Owners Association promotes private and public working forests, responsible forest management, and a strong forest products industry across New Hampshire. This site is built on Joomla 3 and CiviCRM. It has a beautiful responsive template that is super functional on all platforms: desktops, tables, and smartphones. On small screens the header is reconfigured on the fly to deal with the limited space. The menubar gets is collapsed and placed under the menu icon. The photo on the left shows how the site looks on an iPad mini. For this project I came up with a process for discussing and designing the website. My simple job aid is a collection of cut up pieces of construction paper marked up to represent each feature NHTOA might need on their website. In a meeting with the NHTOA staff, we talked about what the site would need and should to. Then I was able to put together paper prototype using the job aid right there at the meeting. 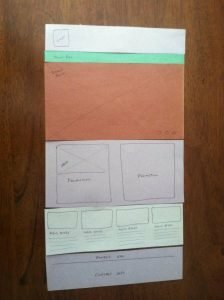 The paper prototype represents what the site might look. The result is a good rough layout for the template to be created from. I snapped this photo of the rough layout with my phone, and presto magico we’re ready to get started. If you want help laying out your organization’s website give me a call: 603-497-2500. I would love to see this website, Kimball, but Google tells me that it is unavailable! Is it just offline temporarily, or is there a problem? I am trying to access it from France….